Will it work under Linux? Or will there be a demo, so that I can check it works under Wine? Ossuary uses Adobe Air, which winehq says should work under Wine. I can’t make any full guarantees, but I’ve gotten a report from a friend that Ossuary seems to work fine under Wine (stock Wine on Ubuntu 13.10). So: no official Linux support, but your chances seem good. I’ve thought about a demo; it’s not a very demo-able game, but I might be able to put something together. That won’t be for a while, though. Thanks. It seems to work fine indeed! All of these things can be achieved. The demons can’t be touched when they have a barrier around them. Each one has different behavior. The torches can be lit. It requires you to figure out secrets about the Ossuary and its history. The required people may not be glowing. There should be 100 obols in total. One may be beneath a cabbage. I had to find the solution for the right-hand torch in the design notebook, though. Was there any clue in the game to help me find the path? Each torch has its solution in the game itself; the design notebook isn’t needed. If you’ve got 99% and it looks like you’ve done everything, my guess is that you have not recovered whatever sin you’ve given to the museum. It could also be a bug. Indeed, I haven’t recovered the sin I donated. Since I’ve been spamming the comments with questions (sorry! 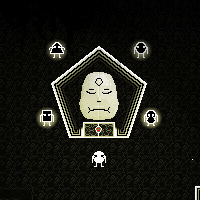 ), I may point out that I find Ossuary great. The atmosphere, dialogues, and the intellectuality really hooked me. Surprises at every corner, and an interesting journey through absurdity and lies. The one slightly bothersome point was the anatomic riddles. The logical answers I could think of didn’t work out, so I ended up doing an exhaustive search. Even when faced with the solution, it didn’t sound very obvious (hm, a palmtree?). Thanks for the great feedback! :D Concerning the anatomic riddles, I had concerns about cultural unfamiliarity; if you don’t mind my asking, are you from the US? I can imagine that folks from other places would have more trouble with wordplay-based puzzles written by an American. American here. I was perplexed at the palmtree pun myself. All the other body part riddles were fine, I thought. No, I’m French, and English isn’t my mother tongue. I don’t have anything constructive or even interesting to say, but I just wanted to express how much I love your games Greg – and Ossuary is no exception. It seems to be going criminally unnoticed at the moment and that bums me out. I’d really love to see more work from you soon. I’m having great difficulty with every demon except the Academy demon, and am unable to figure how to light the torches or unravel the secret of the labyrinth in the Museum. Otherwise I’ve completed everything in front of me. Any pointers to get me unstuck? Specifically, any pointers on how to get the Five-Sided Temple demon to drop its barrier? I’ve managed to deal with the other three now. I have also found a ‘key’ to the Museum labyrinth, but am uncertain what word I should be creating using this key. Regarding the Temple demon: Patience may be in order. Regarding the labyrinth: someone in the Academy may have a useful historical factoid.